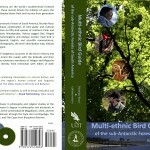 To launch this book, the Sub-Antarctic Biocultural Conservation Program hosted an evening celebration of art, poetry, philosophy and science, which was headlined by co-author, poet and uñumche (Mapuche birdman) Lorenzo Aillapán to UNT to offer his poetry in a public presentation and to various classes. Likewise, Paola Vezzani, designer of the new edition and currently Regional Director of Culture for Magallanes, attended the launching ceremony to talk about the link this book expresses between science and the arts. These events also coincided with the one year anniversary of the Sub-Antarctic Biocultural Conservation Program, which allowed as well the inauguration of the program’s new offices in the EESAT Building, an event attended by the university administration, faculty, student and other friends. For more information or to order this new book visit UNT Press.